The 5th Annual Columbus Day Challenge was a huge success. We have grown from 130 teams in 2016 to a sold out event, well over 220 teams in 2018, pulling from all across New England. The tournament's quality competition and regional draw were big factors in its success. Thanks to all who attended and congratulations to all the champions! U11-U15, 3 games guaranteed, possible 4th game depending on playoffs. 2018 Columbus Day Challenge Results. 8. We Won't Make You Wait 6 Hours Between Games! 10. A GREAT SOCCER EXPERIENCE!!! 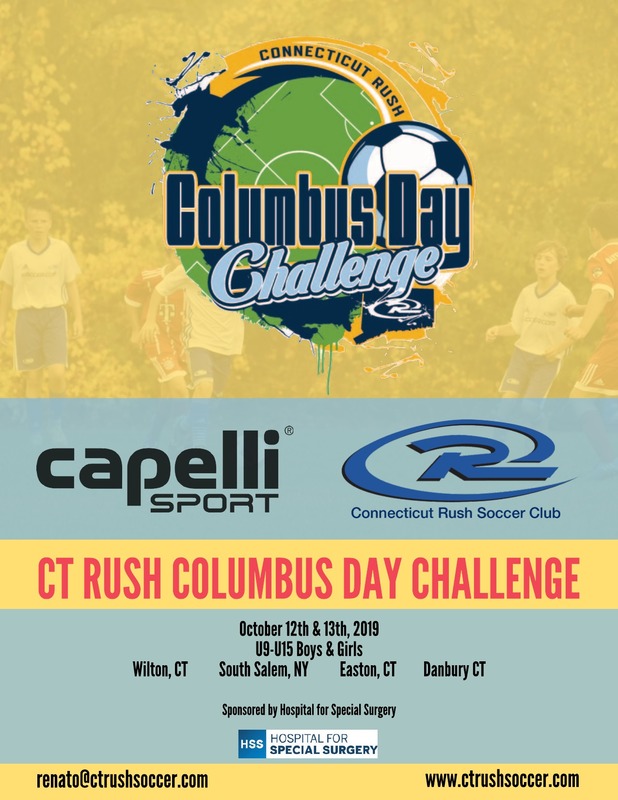 For the past two seasons, GPS RI have travelled South, to Wilton, CT, for their wonderfully hosted Columbus Day tournament. In the build up to the tournament, the club have been extremely helpful and accommodating in our attempts to schedule games to coaches can attend all of their teams games, while they have also gone out of their way to help our whole club find the most suitable hotels possible. Having a tournament where we can have our 25+ teams within close proximity to each other makes for an extremely enjoyable experience for all of our families – it allows us to continue with the family feel that we strive to provide. The competition at the tournament has been excellent, providing competitive games for our teams, which continues to aid their development. It also provides us the opportunity to play against teams from other states (NY, CT etc) and forge friendships and relationships that we otherwise may not have the opportunity to do so. Overall, Renato and his team have provided a professionally run, competitive tournament, and continue to go above and beyond, to provide a positive experience over the full weekend for our families.